The Boston & Maine Railroad bought twenty-five "Berkshire" type locomotives from the Lima Locomotive Works and numbered them 4000 through 4024. These B&M "Berks" had a very distinctive appearance. The feed water heaters circled the crown of the smoke box and lent a cavernous look to the front of the locomotive. The first batch of twenty locomotives, designated Class T-1a, arrived in 1928 and had 63" diameter drivers, 27.5" x 30" cylinders, a boiler pressure of 240 psi, they exerted 66,500 pounds of tractive effort and each weighed 390,200 pounds. The last five, designated Class T-1b, were delivered in 1929 and were similar except they had a tractive effort of 68,990 pounds and a weight of 403,000 pounds. From the beginning, the B&M had problems with their Lima built "Berkshires". The problem was with the trailing four-wheel truck. Because of the large firebox and large ash pan the locomotive had to have an articulated frame. The back end of the firebox had to rest on a moving base and it was subject to buffeting and twisting, resulting in chronic leakage at the mud ring, side sheet stay bolts and the throat sheet, as it tried to wiggle from side to side to follow the motion of the trucks. Also, this arrangement would sometimes cause the rear wheels to derail while backing up. During the closing months of World War II, the western railroads were in dire need of motive power to handle the shift in material and personnel from the European front to the war in the Pacific. The Boston & Maine was never really satisfied with its Lima built "Berkshires" and jumped at the chance to help the war effort and to unload its "lemons". The B&M sold ten "Berkshires" to the Southern Pacific and seven to the Santa Fe. There are no surviving B&M 2-8-4 "Berkshire" type locomotives. Numbers 4000, 4002, 4005, 4006, 4009, 4010, 4012, 4013, 4014 and 4019 sold t o the Southern Pacific in 1945 and became SP numbers 3500-3509. Numbers 4001, 4 003, 4004, 4008, 4011, 4015 & 4018 sold to the AT&SF in 1945 and became AT&SF numbers 4193, 4197, 4794, 4195, 4196, 4198 and 4199 in that order. Nu mber 4017 scrapped in 1948. 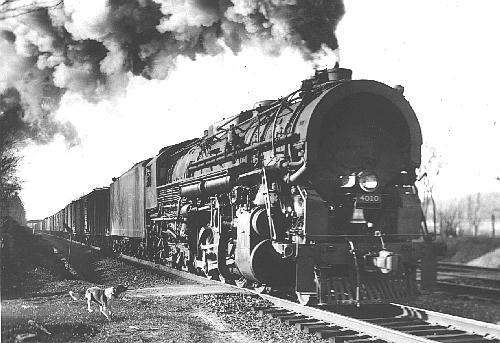 Number 4007 scrapped in 1949. Number 4016 scrapped in 1950. Number 4024 scrapped in 1946. Number 4020 scrapped in 1947. Number 4022 sc rapped in 1948. Number 4021 scrapped in 1951. Number 4023 scrapped in 1955. Boiler had Coffin feedwater heater wrapped as a collar around the smokebox, valve motion had limited cutoff. Firebox heating surface included 22 sq ft (2.05 sq m) of arch tubes and 99 sq ft (9.2 sq m) of thermic syphons. 14" (356 mm) piston valves supplied steam to the cylinders. T-1as (works numbers 7277-7296 in May 1928, road numbers 4000-4019) were delivered with Baker valve gear, but all had the Walschaert gear by 1947. T-1b (works numbers 7374-7378 in August 1929, engine numbers 4020-4024) engine weight was 403,000 lb (182,798 kg). Indeed, by 1947, engine weight had climbed to 406,900 lb (184,567 kg) for the whole class. Boston and Albany A1 (Locobase 46) and Illinois Central #7000 (Locobase 48) very similar. The T-1b's tenders were much bigger. They weighed 139,000 lb (63,049 kg) empty and 330,600 lb (149,958 kg) when carrying 17,500 US gallons (66,238 litres) and 26 tons (23.6 metric tonnes) of coal. Drury (1993) comments that the design of the trailing truck, which encouraged derailments and the lack of adhesion on the drivers, which made them slippery, contributed to the railroad's disenchantment with the class. He also noted that the rear of the firebox was supported by the trailing truck, and "as the truck swiveled, twisting forces were placed on the firebox, which wasn't designed for such stress." 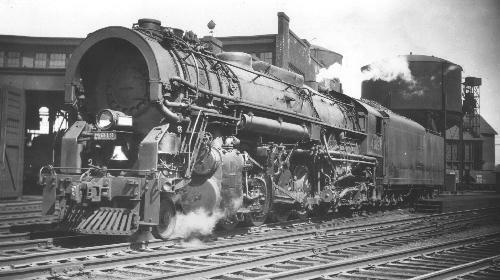 Seven of these were sold to the Santa Fe in 1947 as that railroad's 4193 class; the Santa Fe rebuilt them at the Topeka Shops.